Is there anything more life affirming than glowing, saturated, natural green? Green fields, green mountains, bright green new grass or green Malachite. Now while all those plant type things are green due to the chlorophyll inside their structures, Malachite is green due to it’s high concentrations of copper. In fact, ancient Egyptians actually mined this material, which was then ground for eye shadow, painting pigments, and smelted into puddles to recover the copper ore in a more managable form. This beautiful room has 8 columns clad in massive slabs of Malachite, as well as a Malachite inlaid floor, a series of Malachite vases, and several Malachite-topped tables. The boulder of raw material that produced all this took nine years to pull from the ground, and weighed 260 tons. I don’t have 260 tons of Malachite. In fact- I don’t think I’ve ever seen 2 pounds of Malachite in person, but one just can’t help but be interested in such an unusual stone. Malachite is very soft, and brittle- as well as being extremely sensitive to both heat and acids. Caring for malachite jewelry should be done with a mild soap and gentle cleanser. Never steam or ultrasonically clean jewelry containing Malachite! The reason for all this care is due to the way the stone is formed. 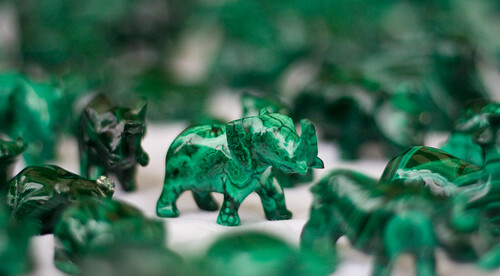 Malachite is actually a secondary mineral. Already I hear the clamoring for an explanation… A secondary mineral is what is formed when a chemical reaction occurs between two other substances. It’s a bit like mixing water and gelatin. One’s a powder(the mineral) one’s a liquid( a second substance). Mix them together, and you have that squishy semi-solid Jello! Or Malachite, as the case may be. In this instance, water containing carbon dioxide or other carbon bearing mixtures, flows over copper ores. The flow of the water over the copper forms a green oxide.Eventually, this oxide solidifies- while still showing the “flow” of the water that helped to create it. But wait! you say All this talk about green Malachite- I’ve seen something that’s blue that was called Malachite too! So you can see why Malachite is so soft and brittle, though, right? Something that forms from water and copper oxides is going to be nowhere near as strong as rocks that are formed from solidifying lava, like granite. But there’s an upside to the softness of Malachite. It carves very very easily. Aren’t they cute?! And less than an inch tall! That wouldn’t be an easy feat in most other stones on earth! There you go- Malachite in a nutshell. One of the most unique rocks in the world. Malachite is OK. Personally I prefer Tourmaline (also green) or maybe Jade. Maybe there are other colors Kaelin? I have this fabulous 3 carat Tourmaline stone set into a 14 Karat gold ring. Did I get the C & K mixed up I wonder. The neat part is that the Tourmaline has a smooth cabochon like face with a faceted back, Unfortunately Tourmaline is a relatively soft stone and easily scratched, although not as soft as Malachite. I’ve had to disassemble the ring twice now to repolish & reset the stone. The gold ring is hand-carved in the Art nouveaux style, absolutely beautiful! It’s about time to repolish it again. Thanks for your thought, but I actually did do that the last time the stone was polished (I built up the setting around the stone), but in retrospect I think it looks ugly. I prefer the design when the smooth stone surface is raised above the setting; Unfortunately that makes the stone a lot more vulnerable. I think I just have to be more careful & take off the ring when I’m working on a project or when there’s any chance the stone might come into contact with a hard or abrasive object. Right now it’s in a chamois bag waiting for resetting & polishing.